Why Summer Heats Foster Pollution Spikes? For once, we’ll discuss outdoor air quality – we spend most of our time indoors, but outdoor air quality is also important for many reasons. Building ventilation systems draw air from outdoors to replenish indoor air, and we are of course exposed while commuting or taking a walk. This is not a breaking news, outdoor air pollution has been linked with various negative consequences such as an increase in respiratory illnesses as well as climate change. This article aims at explaining why hot weather conditions in summer affect pollution. What Concentrations of Ozone and Fine Particulate Matter Are Considered Acceptable? Although outdoor air pollution is in great part a result of human activity, pollutant concentrations are not constant and depend on various factors. Some pollutants such as nitrogen oxides (NOx) and sulfur oxides (SOx) are produced directly by vehicles, power plants and other fuel-burning equipment. On the other hand, ground-level ozone (O3) is not emitted directly, but is actually the result of chemical reactions in the atmosphere. Particulate matter (PM) can be either emitted directly or formed from other pollutants through chemical reactions. As you might recall from science textbooks, high temperature speeds up the rate of chemical reactions, which means the concentration of ozone tends to increase during heat waves, as well as the amount of PM formed from other pollutants. To understand how heat waves worsen outdoor air quality, it is necessary to review the formation process of two key pollutants: fine particulate matter and ozone. Complicating the symptoms of pre-existing conditions, such as asthma and bronchitis. Other than having medical consequences, ozone also has an economic impact. Individuals suffering from the symptoms above become less productive in their workplace, or may even be forced to take sick leave. The formation of ground-level ozone requires four key ingredients: nitrogen oxides (NOx), volatile organic compounds (VOC), heat and sunlight. The first two are emitted directly as a result of human activity, while the last two depend on the weather; as a result, outdoor air quality can be expected to worsen with high temperature, and especially in hot summer days without clouds, where there is also an abundance of sunlight. This is a very simple example. 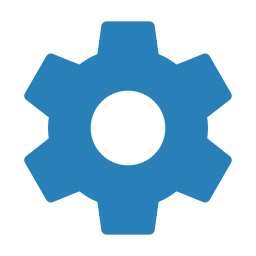 Most reactions that form ozone from NOx and VOCs are far more complex and involve several intermediate steps. Nitrogen oxides or ammonia can react to form nitrates, which gather as solid particles suspended in the air. In other words, solid pollutants (PM) can come from gaseous pollutants. Sulfur oxides lead to the formation of sulfates, which are also solid. VOCs can react to form larger hydrocarbon molecules, which remain suspended in the air in solid form. Just like nitrates and sulfates, these solid organic molecules can gather into larger particles that are considered particulate matter. When high temperatures coincide with periods of high atmospheric pressure, ozone and particulate matter can reach dangerously high levels. While high temperature leads to faster formation of ozone and fine particulate matter, high pressure makes it difficult for natural air currents to dissipate these pollutants. Rainfall is generally beneficial for air quality, since particulate matter in the air adheres to water droplets ands falls to the ground. Air pollution and global warming interact with each other, mutually compounding their effects: just like high temperature causes spikes in the concentration of some pollutants, air pollution itself also leads to higher temperatures. Thus, climate change and air pollution can be addressed more effectively together than in isolation. By itself, high temperature is not a direct cause of air pollution, but it accelerates the reactions that form key pollutants like ozone and secondary particulate matter. Human activity is the main source of reagents, especially the use of fossil fuels; their combustion releases nitrogen and sulfur oxides, as well as volatile organic compounds. Ozone in the lower atmosphere (troposphere). Ozone is actually beneficial in the upper atmosphere (stratosphere), blocking solar radiation. Black carbon aerosol, a component of particulate matter consisting of suspended particles of pure carbon. It is produced by both fossil fuels and biomass during combustion. Carbon dioxide represents by far the highest contribution to global warming, but all gases mentioned above play a role. It is also important to note than higher atmospheric temperatures allow more water vapor to enter the air, which amplifies the warming effect. Under normal conditions, the Earth’s atmosphere is warmer near ground level and cooler at high altitudes. Since warm air rises, natural convection can carry pollutants away and reduce their concentration. A temperature inversion occurs when the normal variation of temperature in the atmosphere is reversed: air is warmer at high altitudes and natural convection is blocked, which traps a blanket of air near ground level. When this happens over an urban area, pollution can reach particularly high levels due to the large number of emission sources and the lack of air movement. When a city is covered by a layer of smog that ends abruptly at a specific height, you can conclude there is a temperature inversion over the affected area. Smog is trapped because convection is unable to carry it away above a certain altitude. A typical Los Angeles smog. Cities that lie in valleys (like LA) are particularly affected because surrounding mountains trap the cool air from the sides, while the warm inversion layer caps it from above. 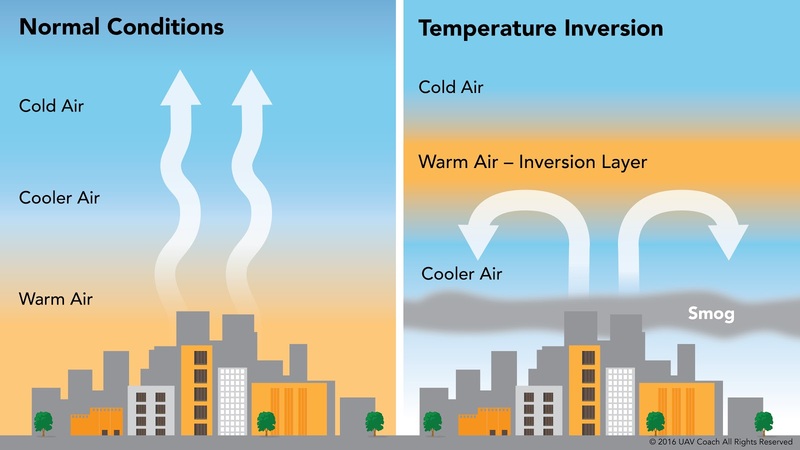 Temperature inversions can be classified into permanent and temporary inversions. Permanent inversions occur in the upper atmosphere (stratosphere) and have a long-term and global effect on air pollution, while temporary inversions occur in the lower atmosphere (troposphere) and are responsible for trapped smog blankets in urban areas – they have short-term and localized effects. For fine particulate matter, the WHO guideline value is 25μg/m3 for a 24-hour period, and 10μg/m3 annually. The US EPA has established 35μg/m3 (24-hour) and 12μg/m3 (annually), while the European Commission has established 25μg/m3 annually and no 24-hour value. In the case of ozone, the WHO establishes a guideline value of 50 ppb, which is equivalent to 100 μg/m3. This value has been adopted officially in Canada and Europe, but the US Environmental Protection Agency is less stringent, establishing the accepted ozone concentration at 70 ppb. To keep the concentrations of ozone and secondary particulate matter under control, it is important to consider that both are the product of chemical reactions that involve other pollutants. There will always be high-temperature days with plenty of sunshine, and the weather is impossible to control, but the reagents that lead to ozone and PM formation can be regulated: nitrogen oxides (NOx), sulfur oxides (SOx) and volatile organic compounds (VOC). 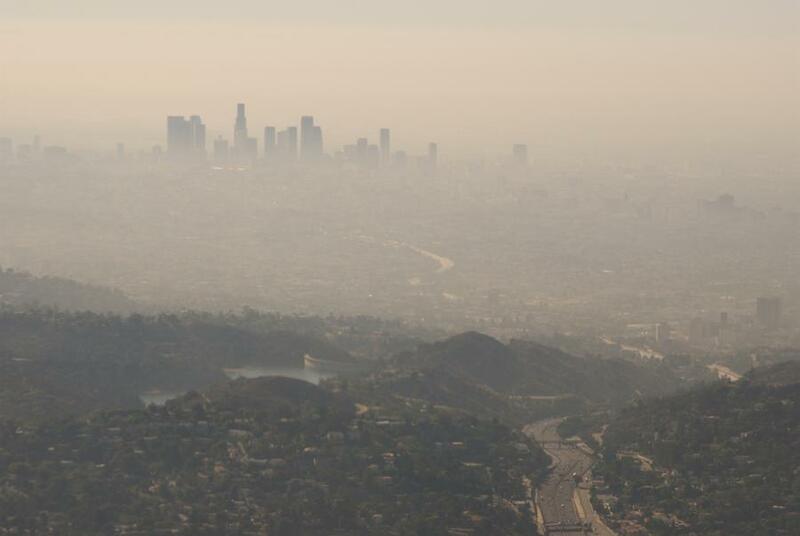 Particulates and ozone have different consequences on human health. PM affect the respiratory and cardiovascular systems and have a carcinogenic effect while ozone is an irritating gas for mucus, eyes and lungs. Spikes occur at different times of the day too. Ozone is due to sunlight so it gets more concentrated during the afternoon when UVs are stronger. PM are out on early mornings and late afternoons when car commute and residences use heating. Trying to control all sources of NOx, SOx and VOCs at once would be impractical and extremely expensive, so action must target their main sources, which are motor vehicles, industrial facilities and power plants. The two complementary approaches to follow are monitoring and legally-enforced regulations. The relationship between high temperature and decreased air quality has been observed in many cases in recent years. For example, India experienced a peak in outdoor air ozone concentration in April 2016, reaching 75 ppb (150 μg/m3), which is 50% higher than the World Health Organization guideline value. The event occurred after several days of high temperature and low wind – heat accelerates the formation of ozone, while lack of wind leads to its accumulation. The same year, the American Lung Association carried out an outdoor air quality study and found that 166 million US citizens, more than half of the population in the country, were exposed to unhealthy levels of ozone and particulate matter. Of the 25 cities with the most air pollution in the US, seven experienced their highest ozone and PM levels ever recorded, and this was linked with increasing global temperatures – there was also a high occurrence of droughts and wildfires at the same time. Air pollution and global warming are an overall problem rather than separate issues, and there is a strong interdependence between them. 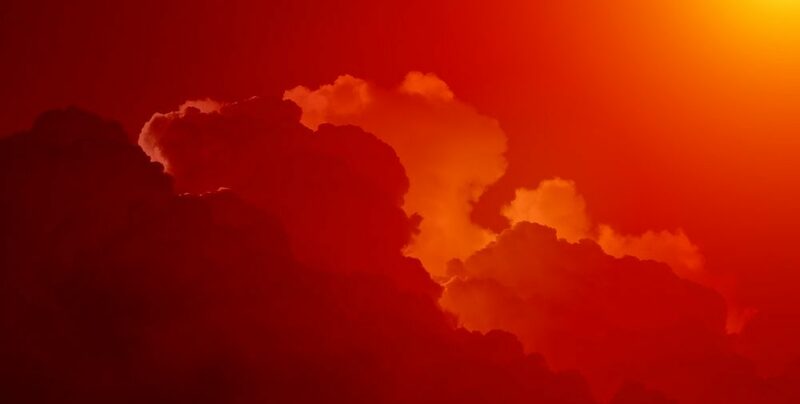 High temperature accelerates the chemical reactions that form pollutants such as ozone and secondary particulate matter, and air pollutants in turn cause the atmosphere to trap more heat. Air quality monitoring and enforceable clean air standards play a key role in fighting both air pollution and global warming, and it is important to note that some pollutants are impossible to regulate directly – for example, ground-level ozone concentration can be addressed by limiting the emission of the nitrogen oxides and VOCs that lead to its formation.